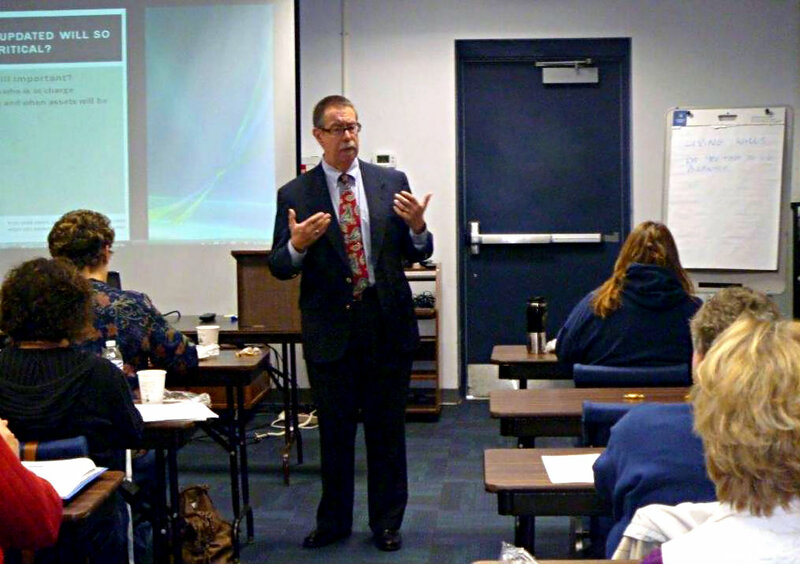 I enjoy making presentations on legal topics for groups and organizations. I’m a frequent guest on Insight on Business- the News Hour Radio show (1350AM 5-6PM weekdays), and I’ve traveled throughout the State of Iowa, sharing information on estate planning and business law. In addition to my “prepared” remarks, I always allow plenty of time for specific questions (think FREE legal advice). Recently I spoke about estate planning as part of a pre-retirement seminar presented by the Iowa State Education Association. Based on the evaluations from the 72 participants, I believe the sessions were successful, and the participants took home some valuable information. I would look forward to additional speaking opportunities on business law or estate matters. If you are part of a chamber, or an association that wants to provide a useful and beneficial educational opportunity for members; let’s talk. And, no, I don’t charge a fee for my presentations (at least not yet!). Recently, I was on the InSight on Business-The News Hour with Michael Libbie. Going on the radio is always a great experience with him, and being able to reach out to their audience with information that is useful to the community is something I look forward to each month. In this video, Michael and I discuss Part One of my three-part series of What Happens to Your Business if Something Happens to You? THIS IS COMPLICATED. You need a PLAN to be developed with the guidance of an attorney who understands BOTH business issues and estate issues. Sole proprietorships- EVERYTHING is an “ownership” decision. The sole proprietorship is indistinguishable from the owner. Member Managed- Each member has full and equal rights in ALL of company’s activities (Iowa Code §489.407(2)). Accounting records and Minutes of meetings, PROVIDED they are related to a “member’s interest as a member” (Iowa Code §489.410(2)(b)) NOTE this is more limited than a shareholder’s rights to information. Sole proprietorship- Holder of a power of attorney for business matters, or a personal representative (conservator, executor, or administrator) succeeds to “ownership” for the purposes of ownership decisions. General Rule- The Executor is a fiduciary and must act in the best interests of the beneficiary. It is common practice to specify the powers of an Executor in the Will. The Will determines who will be the ultimate owner of the business. In the absence of a provision to the contrary all property is required to be distributed pro rata. Determination of WHO is Administrator is left to the determination of the court- any “qualified” person may be Administrator (Iowa Code §633.227). The Trust continues even after the death of the grantor. Powers can be exercised by successor Trustees. The terms of the trust will designate future owners. You could establish a Buy/Sell agreement with an appropriate buyer. If you have a co-owner in the business, BOTH/ALL of you should investigate these issues. We realize that this is a lot of information to take in. At Kreamer Law Firm, we can aid you in planning for the future of your business. Please feel free to contact us with any questions you have by visiting our website, www.kreamerlaw.com, or calling us at (515)727-0900. I am very much looking forward to being able to speak next Saturday, November 8th, and again the following Saturday, November 15th, for the Iowa State Education Association. The topics for this seminar are all about life after retirement: the benefits you can look forward to receiving, financial help with investments, and important Social Security information. What I’ll be able to share during these two seminars is something that Kreamer Law Firm works on daily: Estate Planning. It’s such an important part of planning for the future and I want to answer some of the questions we get asked most and give advice on how to take charge of your retirement. In a prior blog, I discussed trusts that can be established in a grantor’s lifetime. In this blog, I’ll discuss trusts which are established after the grantor dies: a testamentary trust. These trusts take their name from the fact that they are established by the grantor’s Last Will and Testament. The purposes of these trusts are to prevent a beneficiary from squandering their inheritance as well to make sure the beneficiary has access to the funds for reasons that the grantors specifies (like education or health care needs). In the event there is a disagreement between the beneficiary/beneficiaries and the Banks, there will still be harmony in the family (the children of a child are not mad at their Uncle). As indicated above, a primary reason for establishing a testamentary trust is to protect/preserve a bequest until a beneficiary is capable of using good judgment. Accordingly, the beneficiaries are normally described by age. Example: if any beneficiary is under the age of 30 their share will be held in trust. Until they reach the specified age(s) of distribution, the trustee is charged with investing the assets and spending the assets on behalf of the beneficiary in ways specified by the deceased grantor. Example: the Trustee shall expend such sums from the principal or income from the trust as shall be necessary to pay for the education, health care needs, and reasonable living expenses. This raises difficult questions and drafting problems. How much discretion should a trustee be authorized to exercise? Stated alternately, how should a testamentary trust be drafted so that it is unduly restrictive but provides sufficient guidance for the exercise of the trustee’s authority? We attempt to ameliorate this problem by including a set of “principles” to provide direction to the trustee. To quote the poet, sage and philosopher, the late, great, George Harrison: “all things must pass.” In the current context, this means that at some point the trust must terminate and distribute the principal to its beneficiary(ies). This can be any age, or any set of conditions. We recommend that there be at least two distributions at least several years apart. This allows a beneficiary to “mature” and/ or recover from a previous lapse of judgment. Although testamentary trusts are often used to preserve a bequest for an underage/inexperienced beneficiary, it is also common for a testamentary trust to be established to protect a bequest to a surviving spouse. In these marital testamentary trusts, the surviving spouse receives all of the income of the trust for their life (distributed at least annually), and the right to distribution of principal in the event of need (health care, maintain standard of living), but any principal remaining at the surviving spouse’s death goes to the children. We normally include a testamentary trust in every Will we draft for our clients. Jason Bourne, who created so many (fictional) widows and underage beneficiaries, wouldn’t need a testamentary trust, but if you have a “real life” spouse and/or children you should consider including a testamentary trust in your Will. If you, or someone you know, are in need of legal services regarding estate planning please feel free to contact the Kreamer Law Firm, P.C. through our website or by calling 515-727-0900. In the previous post, I described how trusts can be part of everyone’s estate planning (besides Jason Bourne). There are essentially two types of trusts: living trusts and testamentary trusts. In this post I’ll provide you with some information about certain types of living trusts. Living trusts (also called inter-vivos trusts) are set up during the grantor’s lifetime. They can be either revocable (changeable by grantor) or irrevocable (cannot be changed by grantor). Revocable Trusts are a popular probate avoidance device. The grantor is the individual who contributes the assets to the trust, is the trustee, and the beneficiary of the trust during their lifetime. The terms of the trust directs the disposition of the assets of the trust after the grantor dies. The grantor reserves the right to amend or revoke the trust at any time. Because of the extensive controls and rights of the grantor, they are ignored for both income and estate tax purposes (i.e. they do not save or avoid any income taxes or estate taxes which the grantor would otherwise pay). The key advantage to these trusts are: (i) that the assets of the trust are not subject to the probate process or its attendant fees and costs; and (ii) they are “private” in that there is no requirement to file them with the Court when the grantor dies. Even if a grantor establishes a revocable trust they should still have a Will so that any of the assets which the grantor did not previously transfer to the trust would become part of the trust aftert the grantor’s death. Irrevocable life insurance trusts (ILIT) can be established to remove the proceeds of life insurance from your taxable estate. Once established, an ILIT is generally not subject to change by the grantor. The ILIT itself owns the insurance policies (and all the incidents of ownership), receives the proceeds when the grantor dies, and distributes the proceeds in accordance with its terms. The grantor can transfer presently existing policies to the trust (which remain part of the grantor’s taxable estate for 3 years) or the trust itself can apply for, and buy, a “new” policy on the grantor (which are immediately excluded from the taxable estate). The funds or the insurance policies that the grantor contributes to establish this trust are considered to be a “gift” for gift tax purposes. Charitable remainder trusts (CRT) present a unique opportunity for those with a charitable intent. The grantor retains a right to payment from the trust (either a fixed payment or a percentage of the assets) for a period of time or the death of the grantor (whichever comes first), and thereafter the assets go to charities designated by the grantor. Although the payments to the grantor MAY be subject to income tax (depending on the composition of the assets and the amount of the payments), the grantor gets a charitable deduction upon funding the trust, and any capital gains from the CRT’s sale of assets are attributed to the charity rather than the grantor (hence, these are often funded with appreciated which are promptly sold by the CRT and re-invested). Grantors of CRTs often use the tax savings from the charitable deduction to purchase a life insurance policy which “replaces” the assets transferred to the CRT. Look for our Part Two follow-up post on the second type of trusts: Testamentary trusts. By their very nature, trusts are complicated. These blogs are designed to give you an overview which should not be construed as legal advice. If you would like more information on these matters, you can contact us at info@kreamerlaw.com or 515-727-0900 to arrange an appointment. Everyone enjoys watching movies. It’s something that really brings people together while they share the story of the characters on screen; I love it. The other day, I was going through my movies and found the Bourne Series. If you are unfamiliar with Jason Bourne AND you enjoy great films, I strongly suggest this series. Bourne is one of the only individuals whom I can recall who would not benefit from estate planning, as he is a vagabond with no assets save for the clothes on his back and no objective in life but to right the injustices the world places before him. If you closely identify with Bourne, this article is not directed at you. But if you’re like his real-life actor Matt Damon, with a family and assets, do you need to consider establishing a trust? It is a common misconception that trusts are only for the wealthy. Trusts are legal mechanisms which allow anyone to put conditions on the distribution of trust assets (those assets owned by the trust) upon death. This use for a trust exists in a vast majority of the estate plans we help create, regardless of the testator’s wealth. Like estate planning, the purpose of a trust is to emphasize the planning aspect and allow the grantor precise control over his or her estate after death. We are especially fond of testamentary trusts to help plan for any contingencies which may arise. In the next blog, we’ll explore the different types of trusts, but in the meantime if you, or someone you know, have any questions regarding estate planning please feel free to contact the Kreamer Law Firm, P.C. at http://kreamerlaw.com/ or by calling 515-727-0900. Following the formal presentation I took questions from the attendees. The one item that stands out was a question about the size of transactions I normally worked on. I responded that in my 30+ years I have worked on transactions ranging from start-ups all the way through the sale of a $45,000,000 company, but the most important transaction is whatever my client(s) need to accomplish. 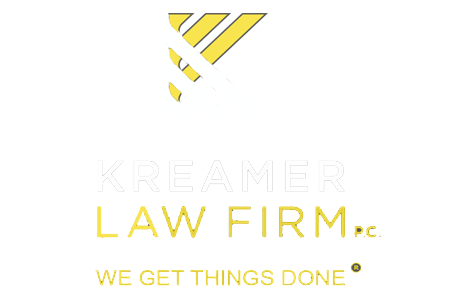 The Kreamer Law Firm specializes in business law as well as estate law. We Get Things Done! What’s the process behind the transaction numbers? Please consider joining me on August 13th. 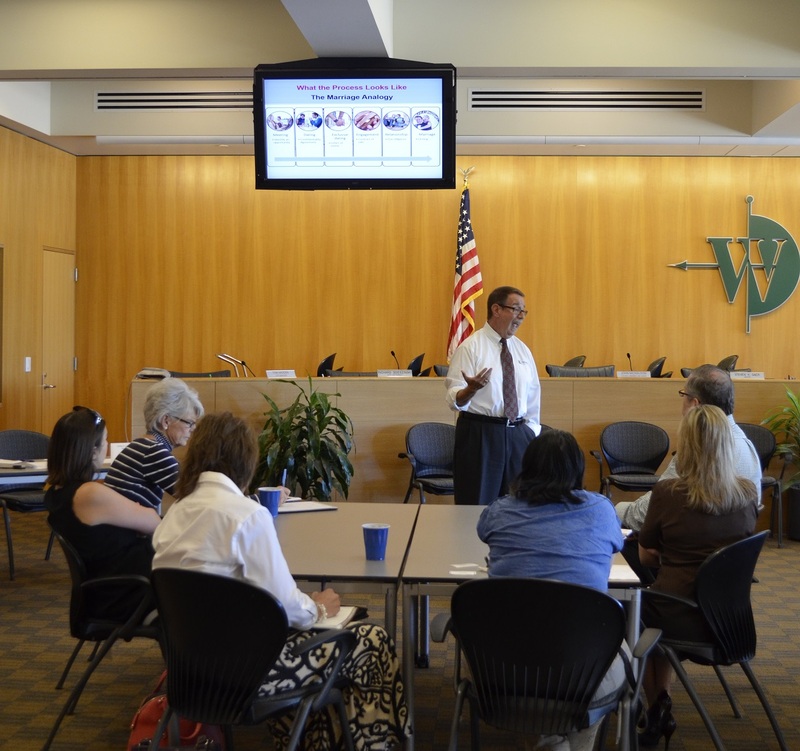 I’ll be hosting the Lunch and Learn event through the West Des Moines Chamber of Commerce and talking about this topic which is really, very useful in a city like West Des Moines where businesses and companies thrive. Buying or selling a business can be a very tricky process; even in a simple transaction there can be many questions. Come to the Lunch and Learn on August 13 which will be held at 4200 Mill Civic Parkway West Des Moines, IA and find out more about what it takes to get through the buying/selling process. The end result can be very rewarding for both parties. This will be a great event and I can’t wait to answer your questions. Click this link to sign up. You don’t need to be a member to attend, so feel free to bring any and all questions you have. The law in Iowa sets a minimum wage of $7.25/hour and applies to all employers whose gross annual sales are $300,000 or more. The Federal minimum wage is the same $7.25/hour and applies to all employers whose gross annual sales are $500,000 or more. When both the Federal requirements and state law apply, it’s actually the law which sets the higher standards that must be followed by the employer. So, in the states that have passed higher minimum wage rates, the local law actually trumps Federal law. The laws on wages in Iowa have some slight exceptions. For example, if the business employs tipped employees (defined as an employee who makes $30/month or more on tips), then the business can pay as little as $4.35/hour (Iowa) or $2.13/hour (Federal). However, in any given week where the employee’s wages do not average at least $7.25/hour, the business is required to pay the difference. Another income regulation to consider is that Iowa law also allows for an employer to pay an employee an “initial employment wage” of $6.35/hour for that employee’s first 90 days of employment. 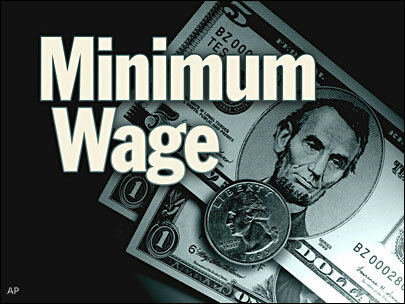 Federal law allows for employees under the age of 20 to be paid as little as $4.25/hour for the same 90 day period. This period allows the employee time to train until they are able to fully handle the workload. If you, or someone you know, are in need of legal services regarding employment wage questions or employees, feel free to contact us at Kreamer Law Firm, P.C. through our website at www.KreamerLaw.com or by calling us at 515-727-0900.